US Secretary of State Condoleezza Rice on Monday appealed to Syria's Arab neighbors to pressure Damascus to close its borders to foreign militants seeking to join the Iraqi insurgency. She also voiced optimism about Iraq's emerging multi-ethnic government but predicted difficult negotiations as a constitutional deadline nears. "Somebody will threaten to walk out and there will be a lot of drama around it because that tends to happen in political processes ... but they've shown remarkable ability to deliver," Rice said of the Iraqis as she headed home from a brief visit to that country. "As with any political process ... in any country, there will be some 11th hour character to it," she added. Speaking to reporters on her plane, Rice also said the more North Korea steps up its rhetoric about its nuclear weapons program, the more united the world community will become in response. "Escalation on the part of the North Koreans is going to deepen their isolation a lot," Rice said. She also said bringing the dispute over North Korea's nuclear program to the U.N. Security Council was an option. Returning from a one-day trip to meet Iraq's new leaders, Rice praised the expanded role given Sunni Arabs and said she was confident the Iraqi government could meet important deadlines. At the same time, she blamed Syria for complicating the new Iraqi government's efforts to quell violence. The U.S. military contends Iraq's remote desert region near Syria is a haven for foreign combatants who cross the frontier along ancient smuggling routes and collect weapons to use in some of Iraq's deadliest attacks. "We're going to go back and look again at what the neighbors can do to get the Syrians to stop support for these foreign terrorists who we believe are gathering on Syrian territory and coming across," Rice said. "Their unwillingness to deal with the crossings of their border into Iraq is frustrating the will of the Iraqi people" and leading to deaths of innocent Iraqis, she added. 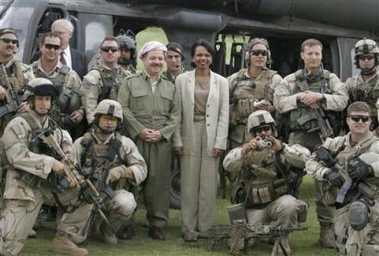 Rice suggested she will try to capitalize on momentum from Syria's withdrawal of its troops from Lebanon this spring. "The Syrians are under a lot of international pressure now because of Lebanon," Rice said. "And the reason that the Syrians are under pressure is they are really out of step with the rest of the region." Beyond undermining Iraq's political progress, Syria supports opponents of a peace deal between Israel and the Palestinians and is trying to keep a hand in Lebanon as that country moves toward contested elections this month, Rice said. "So the Syrians have managed to get themselves in the situation of standing in the way of progress of people in the Middle East, and I would think that wouldn't be a very comfortable place for a Syrian regime to be." A working democracy in Iraq will choke off support for the homegrown insurgency over time, Rice said, adding that she was encouraged by Iraq's progress toward a national constitution and toward assuming a greater role in establishing security. Rice said one patient at a Baghdad hospital she visited Sunday was a young Iraqi woman who was badly injured while protecting a government figure. "She basically threw herself in front of a (bomb)," Rice said. "Now that's Iraqis taking responsibility for their own security." The constitution, due Aug. 15, is the first critical test for the government that took effect last month. It is not yet clear whether the document will emphasize secular rule or have an Islamist flavor, and how large a role the Sunni Arab minority will play in writing it. Also unknown is how much independence the document will grant Iraq's powerful Kurdish minority. Rice acknowledged that Sunnis are underrepresented on a panel charged with drafting the document, but said all of the government leaders she met recognized the importance of an inclusive government. "They're really struggling with some pretty difficult issues, but I thought there was a kind of willingness and even desire to try and broaden the basis of the people who would be involved in writing the constitution," Rice said.